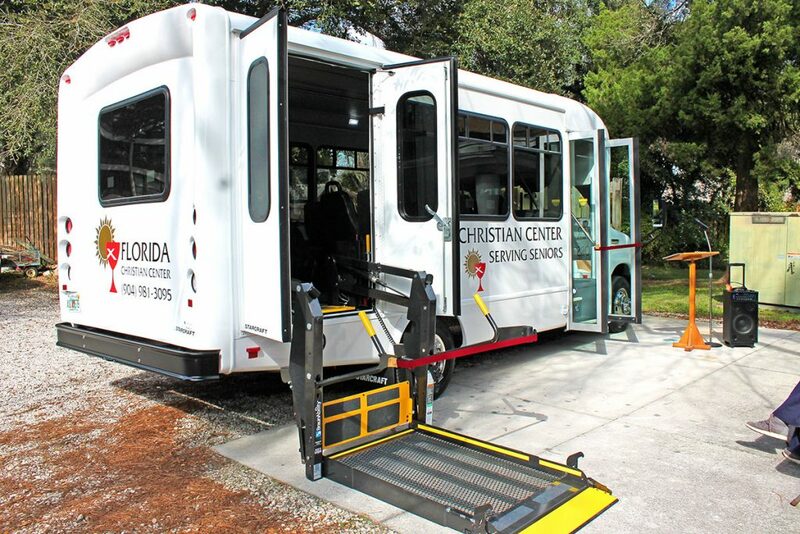 Florida Christian Center celebrates new bus for senior community - The Resident Community News Group, Inc. | The Resident Community News Group, Inc.
After a year spent raising funds to purchase a replacement for its deteriorating 2001 bus, the Florida Christian Center at 1115 Edgewood Ave. S. held an event Jan. 11 to bless Grace, the new 2018 14-passenger bus which will enable the center to continue its mission of serving seniors in the community. Over 50 people turned out for the afternoon event, including representatives from The Community Foundation for Northeast Florida, a major donor. 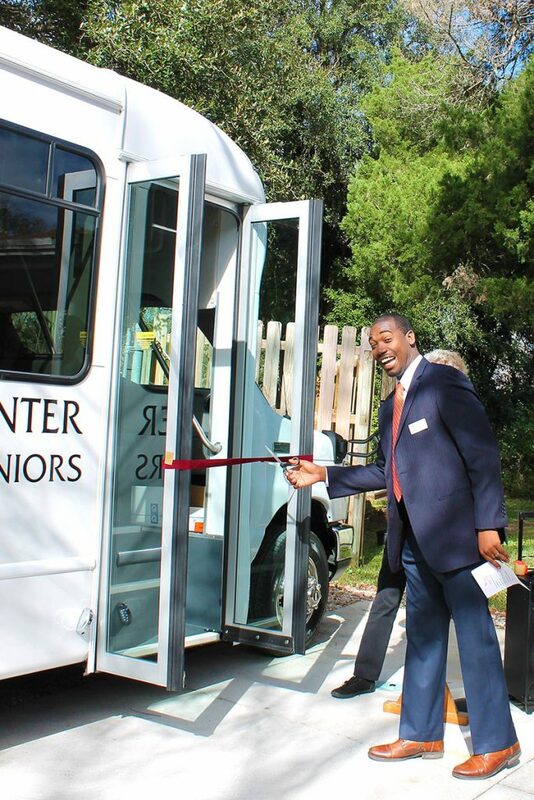 Emmanuel Fortune, program director at The Community Foundation for Northeast Florida, cuts the ribbon for the new passenger bus. The center’s previous bus, which was purchased used in 2011, had started to fail significantly in 2018 and, due to lack of parts to repair the wheelchair lift, some residents had not been able to use the bus since last June. The center’s activity coordinator, Susie Rokosch, uses the bus for weekly trips to the grocery store as well as other outings to events in the community. Equipped with a bus lift, the new vehicle enables residents in wheelchairs and walkers to also participate, according to Weir. 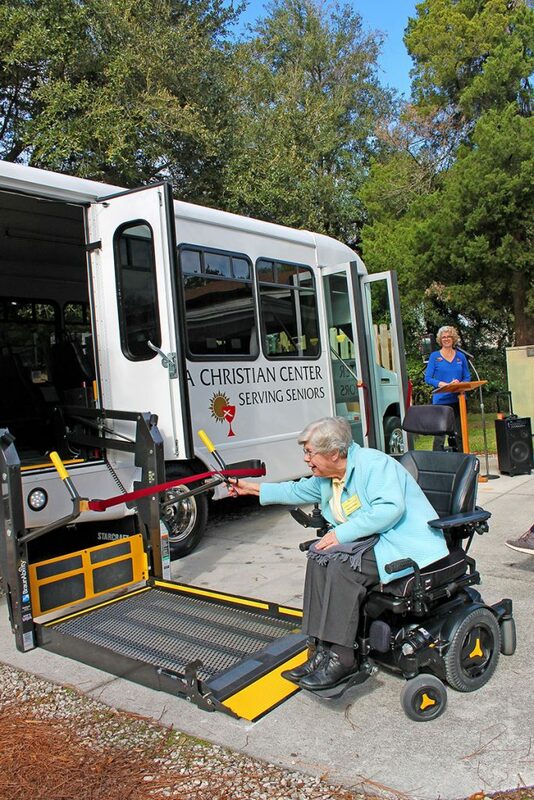 Norma Phillips, resident at the Florida Christian Apartments and a member of the Florida Christian Center’s board of directors, cuts the ribbon to the wheelchair access for the new bus. “We prayed for it, we worked hard for it,” said Phillips. Their dream would not have come to fruition had it not been for a $20,000 grant awarded by The Community Foundation for Northeast Florida through the I. R. Bowen and Katherine H. Bowen Fund. This gift, as well as incredibly generous individual gifts from those who support the ministry or learned of the center’s need, helped them reach the $60,000 needed for the bus. The Florida Christian Center is a ministry to more than 300 residents of the Florida Christian Apartments, Sundale Manor apartments, and Edgewood Condominiums in Murray Hill. The apartments provide independent living for low-income senior and disabled adults. With half of the residents no longer able to drive or have their own vehicle, this vital aspect of the ministry enables seniors to stay connected and involved.